Having personally enjoyed the Le Mans race and camping experience for many years, we, at 1st Tickets Limited, aim to provide packages at competitive prices to race enthusiasts and novices alike. 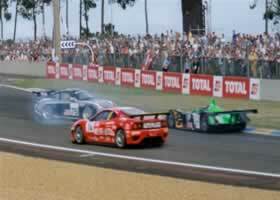 We have been successfully arranging Le Mans tickets for groups since 2002. Our Le Mans packages covers channel crossing, general admission, camping permits, grandstand seats, parking only permits and helicopter flights as well as general advice. In 2008 The Automobile Club De L'Ouest (ACO), organisers of the 24 Hour Race, selected 1st Tickets Limited to become an official agent. This provides us with access to the full range of camping and grandstand tickets for the 24 Hour Race. We also support other events at Le Mans including the Motorbike 24 Hour Race and Le Mans Classic. In 2016 we hepled close to 4500 people with their ticket and travel requirements. We organised and managed a two private campsites at the Le Mans 24 Hours for PistonHeads and the Aston Martin Owners Club, a large private campsite at the Le Mans Classic, and travel & accommodation to the Spa Classic in Belgium. At the Le Mans Classic we work closely with the DDK Porsche Club, Cobra Replica Club, PistonHeads, and Aston Martin Owners Club, organising travel & accommodation, parade laps, hospitality and club display areas. ABTOT cover provides for a refund in the event you have not yet travelled or repatriation if you are abroad. Please note that bookings made outside the EU are only protected by ABTOT when purchased directly with 1st Tickets Limited. Going forward we plan to further extend our event portfolio to include a range of events and driving tours at Nürburgring along with additional events at Silverstone, Spa and Le Mans. The continued company growth and portfolio expansion continue to provide an exciting venture for us all and we look forward to helping you with your travel and tickets plans.